I love it when I'm contemplating writing some deep thoughts, and instead, I come across a fun link-up that requires that requires less thinking and more fun. I feel like all I've done lately is link up or write about the Bachelor. I really do have several drafts of posts that I just need to flesh out a bit more. But that requires time, people, and lately, I have got very little of that. So, that's a long way of saying, I'm linking up with Erin today to give ya'll a glmpse into some of my favorites the blogging world. "Some" is an understatement, there are so very many, but I only have your attention for so long. I love being a part of this community. Blogging is tough—I know to an outsider, it might seem like nothing more than sitting down and writing, and I guess at the surface, that's all it is. But it's also about letting people into your life, and not just the happy things. It's letting people peek into your marriage, your children's lives, your job, your struggles, and your bad days. That takes guts, folks. For me, the best bloggers, and those who I respect the most are honest and real. They're funny without trying too hard. They don't blog for the sake of posting something every day. They always have something tos say, and whatever it is always me smile, chuckle and think. If I can be half as influential to someone else as these ladies have been for me, I'll consider myself succesful. Taylor is the pretty face behind The Daily Tay & The Browse. She literally makes me laugh out loud with almost every post. Not an easy feat. We have tons in common: We both live in Chicago, we're both from the Midwest (Nebraska and Iowa, respectively,) we both are obsessed with our dogs. Obviously we were meant to be. Call me to get a drink sometime, girl! Mary's the sassy broad behind Little Bit of Class, Little Bit of Sass. Mary actually had a huge part to do in actually getting my blog up and running. She and I are both co-workers and friends, and she was a huge help in helping find the resources to get this thing going. From Classy Tuesdays to Wedding Wednesday to Sassy Thursdays, Mary has enough sass and class for everyone! Sami's Shenanigans has got it going on. 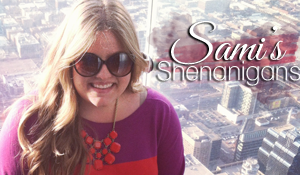 Aside from her amazing Weekend Update Link-Up, I love Sami's stories. She's grown that fantastic place of hers to more than 1,000 followers in just over a year of blogging. I just reached 100 followers today and that took a solid 9 months. In short? She's beautiful, funny, and real. Love. her. The real reason I love Stephanie at The Vintage Modern Wife? She gave me a $25 Sephora Gift Card. I kid, I kid. Stephanie is as down to earth as they come. She loves her husband, she loves writing and blogging, and loves making the cutest little coasters you ever did see! Link up with her tomorrow for Happies & Crappies! I owe the lovely look and feel of my blog to Ms. Alison over at Long Distance Loving. I would not be where I am without her - she did a blog audit, worked with me to come up with the design, colors, headers, etc you see here. And I love it! Aside from that, I connect with Alison so much. My hubby and I did the long-distance thing for too many years and it was tough. I love the inspiration she gives in life, love and fashion! I love Rebecca at Forever After Undecided. She's unassuming, which in my eyes, means she doesn't care what other people think and she doesn't know how awesome she is. I know she is one of my avid readers and everytime I see a comment from her, I smile. Go check her out! I'd love for this place to become a blog that other people are crushin' on. Until then, however, I encourage you to stop over and see any of these beautiful ladies. You are so so sweet! Thank you for including me! Yay for 100 that is awesome.. for me that took the longest was getting to 100 and then after that I think it's easier :) I had no idea that you and Mary were coworkers and friends! She came to dinner when I was in Chicago and I wish you would have come too! I'll be back this Summer I hope so I better see you! Just re-read it again! I love this post (and you! ), thank you again! !